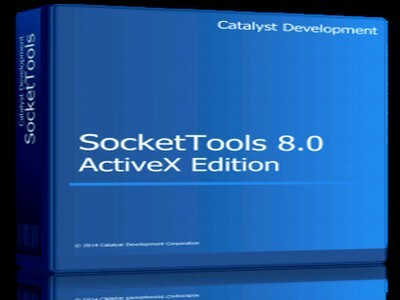 The SocketTools ActiveX Edition is a collection of over twenty Internet controls that can be used with Visual Basic, Visual FoxPro, dBase Plus, PowerBuilder and most other software development tools that support ActiveX controls. Upload and download files, send and receive emails, execute remote commands and access web services with just a few lines of code. SocketTools is designed to make it easy for you to add Internet functionality in your applications, without any complex programming or in-depth knowledge of how the various protocols work. SocketTools supports all of the major Internet protocols, and includes both 32-bit and 64-bit ActiveX controls in the same product. They can be used as standard controls, as automation components for Microsoft Office and other applications, or as scripting components in languages such as VBScript. SocketTools supports both IPv4 and IPv6 network connections and includes support for both standard and secure, encrypted connections using SSL/TLS and SSH. Each control is thread-safe, supports both synchronous and asynchronous modes of operation, and provides the ability to log all of the internal network operations, making it easy for you to debug your application. 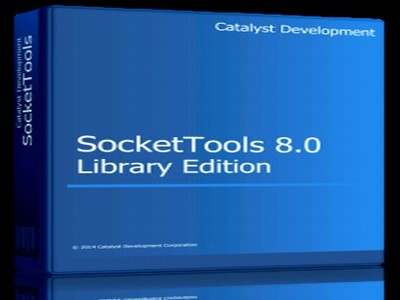 SocketTools includes a comprehensive Developer's Guide and Technical Reference, as well as a large collection of examples. Your projects can be redistributed without any additional runtime licensing fees or royalties, and your purchase includes a thirty day money-back guarantee. Free, unlimited technical support is available to all registered developers. Catalyst is a trusted company with over 15 years experience developing Internet components, with extensive technical support resources for developers new to Internet application development. A minor update to internal functions to use services on the sockettools.com domain. Corrected a problem with the HttpServer LogFormat property in the .NET class and ActiveX control. Corrected a problem with the terminal emulation ActiveX control.